This was a dinner item that I baked last week that was a big hit in our house. If you love pesto on bread, this is a nice presentation, nice enough for potlucks, dinners with invited guests, or to bring as a hostess offering at the next occasion. 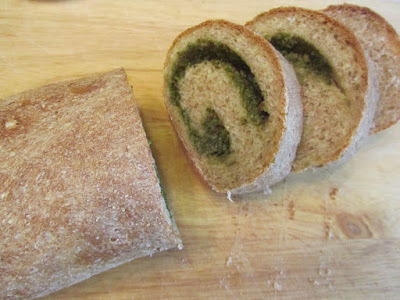 I used a half and half whole wheat/white French bread dough (using this dough, 1/2 of a recipe), and homemade pesto. 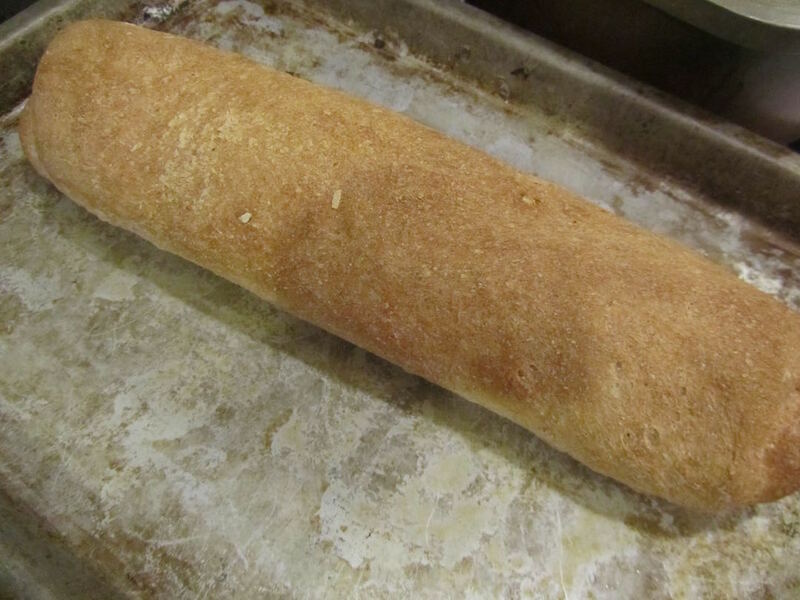 Make one loaf of French bread dough. Just before forming, have your pesto (about 2/3 to 3/4 cup), ready to go. Roll out the bread dough to about the size of a sheet of school notebook paper (9 X 11 inches, roughly). 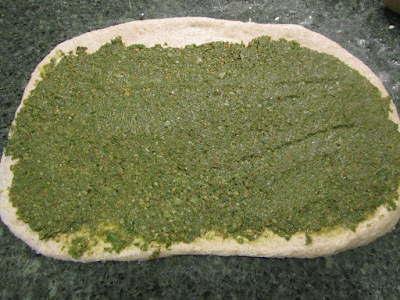 Spread the pesto on thickly, leaving a margin of about 1 inch of dough, uncovered along one of the long edges. 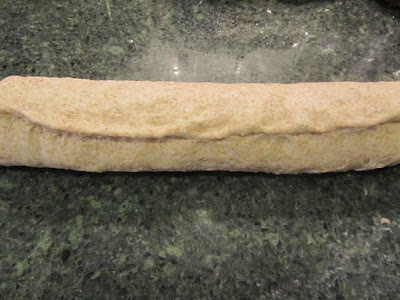 Roll the dough up tightly and pinch the seam. Place seam side down on a greased baking sheet. Allow to rise until double in bulk. 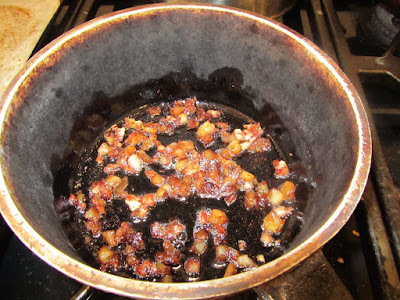 Bake at 400 degrees F, until golden brown, about 25-30 minutes. After a brief cooling, slice into nice rounds, revealing the pesto swirl. your own version, which sounds even better than the original. i will definitely be trying this soon. thanks! It looks so yummy. No baking for me today it is 102 degrees n San Diego. I am so looking forward to fall. Oh, that sounds unbearable! Here's hoping for a cool-down very soon for you! Love pesto on anything...but doesn't the bread separate where the pesto swirl? And does baked pesto taste better? It separates about as much as cinnamon bread does. But as we tend to pull apart a chunk of bread, while eating it, that doesn't seem to matter. I actually couldn't taste any difference between baked and fresh pesto. As you can see in the photo, the pesto remained bright green through baking. It was delicious. I told my husband about your pesto bread and he can't wait to try it!! Yesterday, while eating our bean patty boxed lunch, again my husband commented how pleased he is that I've discovered bean patties (he's the lunch box maker). 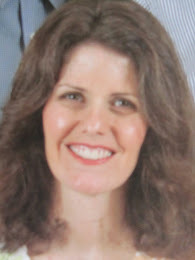 Of course, I have you and your blog to thank for that! !